Many Granges across Connecticut host Grange Fairs (of all shapes and sizes.) Now is the time when the planning for Grange Fairs begin to take center stage. Promotions for your Grange Fair are key to a successful event. Do you have a Premium Book or Flyer? Do you issue Press Releases? Do you have posters hung around your town? Are you talking about your Fair on Facebook and Twitter? Do you send out an e-mail to all your members? And most importantly, do you start EARLY with your promotions and publicity? Granges need to use all the traditional promotional and publicity methods to get the word out to the public about their Fairs. Here’s a few suggestions and ideas that each Grange can utilize when promoting their Fairs. • Advertise you Fair at your other Grange events. Put table tents on each table at refreshments and/or dinners spotlighting your Fair’s activities and contests, hang posters and signage promoting your Fair in your hall, and be sure to handout flyers at each meeting for two to three months prior to your Fair. • Distribute coupons. In this day and age - people love to save money. If your Fair charges admission, then coupons worth 50¢ off admission can bring new people to your event. If your Fair offers free admission, a coupon for a free beverage or snack item will entice the public to attend. • Creative Contests. Not everyone can knit, bake or has a garden full of veggies. Let your imagination flow. Offer something different and fun for the whole family. Ideas: a display of collections, setting a dinner table, recycled art, LEGO building, paper airplanes, and more. Once you come up with your best idea - write a press release just on this contest, create a special advertisement for the newspaper, distribute a special flyer or handout, and poster to promote it! • Offer a “Kids Zone” or a special area just for the youngsters. Offer interactive crafts and demonstrations where the kids can be the center of the action, such as planting seeds in egg cartons, creating friendship bracelets, macaroni art, handprint drawings and more. Promote this area as something special and new. Post on local and family websites and forums talking about your Kids Zone. Distribute flyers to daycare centers, nurseries and schools. • Host a booth at another local event, such as the Farmer’s Market, baseball game, car show, etc. to promote your Fair. Be sure to have flyers and coupons to distribute. 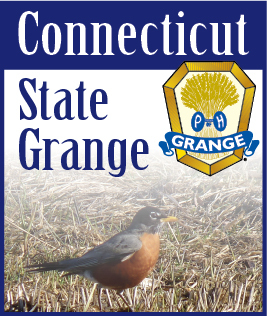 The CT State Grange Public Relations Committee is here to help with your Fair promotions. We can write and distribute press releases about your event. We also offer graphic design services including brochures, posters, flyers and more. All we ask is that you give us plenty of advance notice to ensure we can fulfill your needs! Contact any member of the committee, or e-mail us at information@ctstategrange.org or publicrelations@ctstategrange.org for more information.